Update 8/20/2014 - The flat front with extender waist khaki from Walmart favored in this post is no longer being stocked in Walmart. I'm back in search of the perfect khaki. I have lots of clothes. I suspect it is something psychological from childhood. Growing up on a dairy farm, we didn't have a lot of clothes; we had school clothes, church clothes and barn clothes. In fact they should be outlawed for all waist sizes over 32. Why would anyone think pleats look good with all that bunched up material gelling up front - yuck! I need something trimming and slimming not bunching and looking like lunching... another cut had to be made and bottom line, if it didn't look good, it needed to go. It was hard to let go, but in parallel with identifying what I didn't want, I reassessed what I did want. This flowed seamlessly from my analysis of what to get rid of; specifically, get rid of all pants that were not comfortable AND get rid of those that don't look good for my middle aged physique. I'm a khaki person - no need for jeans. Khakis are just as comfortable plus they look more business casual which is what I shoot for. I love those Haggar Work to Weekend Khakis and if money were no object, I'd definitely go for them, but they hover around $38 (even when on sale). 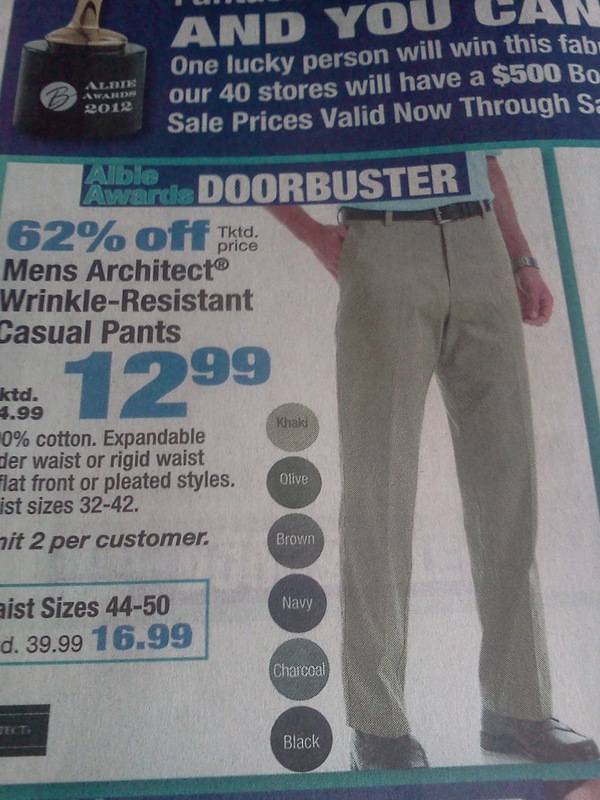 Boscov's has some worthy consideration with their Architect line which often goes on sale. 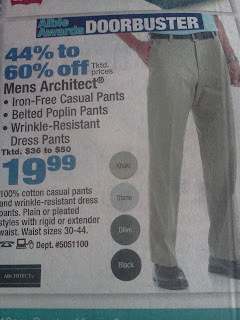 The Architect khakis have 2 levels, the cheaper often goes on sale for around $13 and the upper for around $20, both advertised as "wrinkle resistant". There definitely is a difference and in my opinion, it is probably worthwhile to spend a little more. The cheaper line appears to use a much thinner material and is also much baggier in fit. One thing that was a turn off with Boscov's is that they use the same picture in their advertisement for both their "cheap" version and their "premium" version as shown. 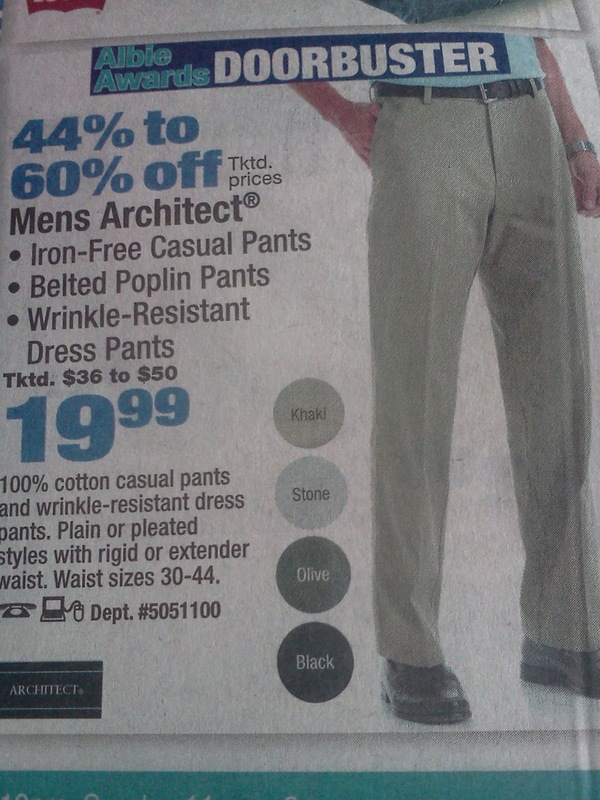 The pant depicted is, of course, their "premium" version which I find a bit deceptive. I have looked in Target, but their pants tend to have the bunchy, elastic waist; not the hidden waistband so they were out. Sears and Kmart were not serious contenders; I have never found anything very exciting with their clothing line that isn't offered elsewhere. I had purchased khaki's at Walmart years ago that had a hidden waste band so decided to revisit Walmart to examine their current offerings. I was pleasantly surprised. Walmart has a "George" line of pants. 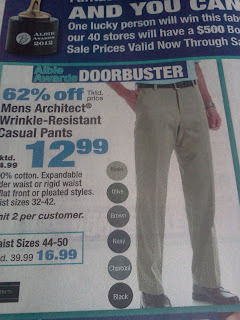 Like Boscov's they also have a cheaper line of Khaki's for around $13 as well as a more premium offering for around $20. Hidden waist band. This is shown in the first photo of this posting. Khaki is 100% cotton and it is a soft cotton without a huge excess of material (so it does not cause the pant to look "baggy" or "bunchy"). Khaki is of good weight (thickness) - many of the cheaper lines appear thin. Khaki appears to be well sown. As shown in the photo below, you will note the finished trim around the rear split). A bargain isn't a bargain if it doesn't fit...even if that $60 pair of Dockers that on the clearance rack for $12; if it's too tight, it's too tight... don't bank on loosing a "couple of inches"... besides weren't you planning to stop by the food court on the way out of the mall? Also, check the inseam... if the pant is too short, no you won't be stylin' by wearing it half way down your boxer shorts. A bargain isn't a bargain if you aren't comfortable wearing. Take time to try on everything before buying. Don't fool yourself into believing that it will "wear in." A bargain isn't a bargain if it looks terrible! Take time to really examine the fabric. Do you like the "feel" of the material? There have been times where 2 identically marked garments felt very different to me. While they were both identically packaged, a closer look at the labels revealed that these garment actually originated from 2 different countries and although they both were "100% cotton" one was clearly softer than the other. Always look at the label - are those shoes that you think are leather, really leather? Closely look at the construction & sewing of the garment. Turn it inside out. Are there loose threads? If you pull at the seam does it feel like it will pull out? Are buttons consistently thoroughly sown or are there threads hanging? Check the zipper - does it work smoothly? These factors all contribute to quality construction. So with those words of wisdom, go to your closet and bag up all those ugly or ill fitting articles of clothing and take it to your nearest charity before you poop out... next, go shopping and feel better with better fitting and more attractive clothing.